The brainchild of Sydney sisters, Elizabeth and Shen-Tel Lee, Bowerhaus jewellery is named in honour of the Australian bowerbird and is known for its eclectic, chic style. To bring their creations to life, the girls have sourced some of the most beautiful materials from all over the world. This long necklace with freshwater pearls and faceted gold stone links takes centre stage and is designed to make you dazzle. Measuring 43cm long, it fits and sits elegantly on everyone and is a feminine combination which makes a great gift. 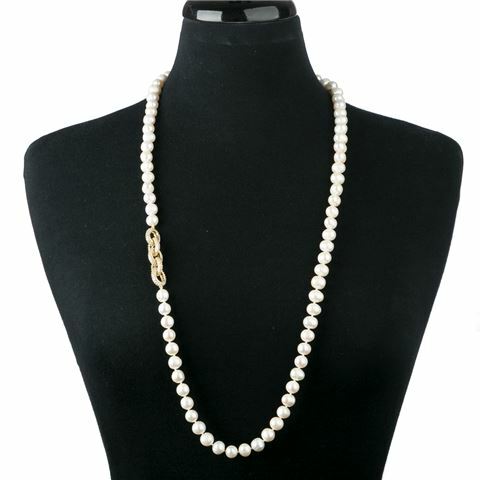 Made with freshwater pearls and faceted gold stone links. A treat for yourself or a lovely gift.